Ylang-ylang is a stimulating, yet relaxing oil with antiseptic and aphrodisiac properties, it elevates the spirit and consoles the heart. Ylang ylang extra has an intense floral, sweet, jasmine-like, almost narcotic sensual, euphoric aroma, perfect for loving massages. It is commonly used to lift depressive states, and address poor circulation. 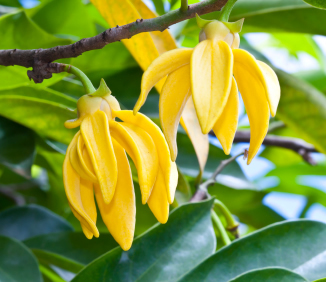 Ylang-ylang helps to keep hair and skin healthy. Add ylang-ylang oil to blends for a sweet, intense floral note. 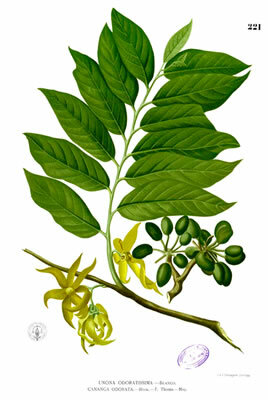 Ylang ylang oil is distilled from the early morning, fresh-picked flowers of the cananga tree. The distillation process is interrupted at various points as the accumulated oil is removed, producing the different grades. The first oil to be drawn off is the highest quality and is graded extra or #1. Yang-yang Complete oil represents the total or �unfractionated� oil, but this is sometimes constructed by blending ylang ylang 1 and 2 together. Top grade Ylang ylang has an intense floral, sweet, jasmine-like, almost narcotic sensual, euphoric aroma. Ylang-Ylang Side Effects: Beware of adulterations with inferior oils. High concentration can cause headache and nausea. Ylang-ylang, Cananga odorata, is the flower of the native Filipino cananga tree. The tree is found throughout tropical Asia. The leaves are long, smooth and glossy, and the branches droop like a willow. The highly perfumed flower is greenish yellow or pink, curly like a starfish, and yields a highly fragrant essential oil.